On November, 2008, in culture, economics, Japan, Technology. About 7 minutes from my house on my bike is a repair shop with an old man in it. He should be retired, and could probably sell his shop for enough to retire on. But he and his wife, both in their 70’s, show up every day. They go slowly, but this guy can fix anything. You rarely find people like this. I like to hang around and talk to him while he fixes my bike. He doesn’t mind. He’s fast, and really good with his hands. A beautiful thing to watch. He loves his work, is my guess. My bike is a little unusual. 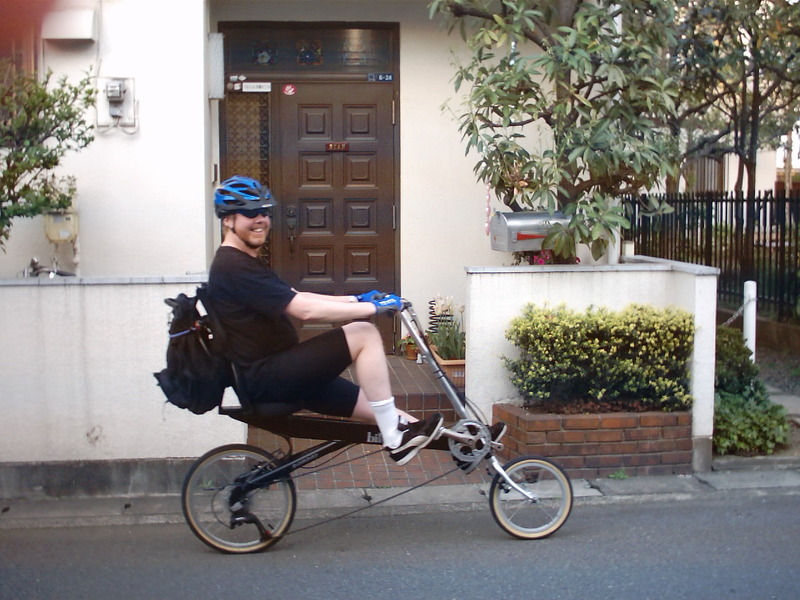 It is called a “recumbent”, because you kind of lay back on it. He had the tire off and replaced in a little over an hour, even though there are two gear switching systems; a 3-speed hub, and an 8-speed derailler, to make 24 gears in all. I wrote about this guy in one of the listening passages for the Entrance Exam for my university. I’ll add the script here, just for fun. I really like riding my bicycle, and it makes a wonderful break from work in the morning and at the end of the day. Riding also helps me to think. Usually the experience is the same every day, but not recently. I rode to work a few days ago, and when I started to go home, my bicycle was hard to push. I looked down and saw that my tire had gone flat. 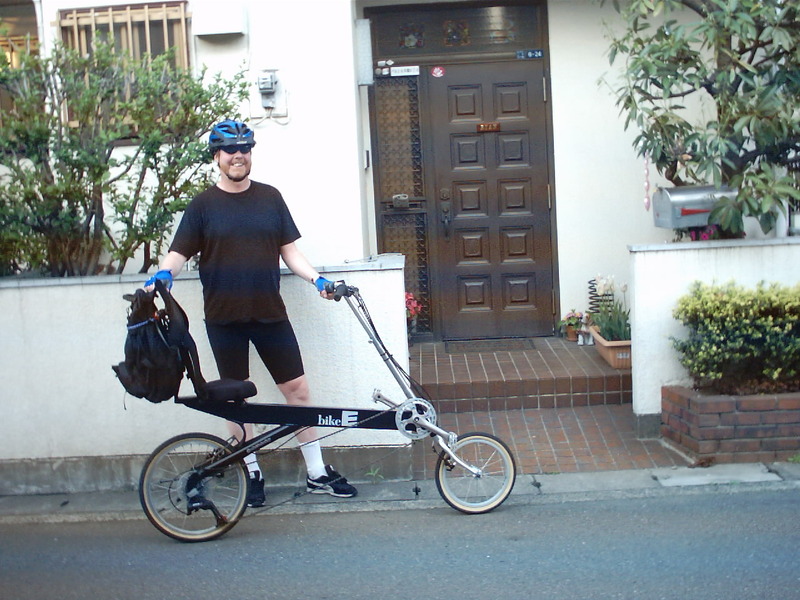 I wanted to get home in time for dinner, so I started pushing the bike, and I had a really interesting experience with the people of Tokyo. I asked a housewife standing outside her house where a bicycle shop was. She didn’t know, but took me to an old lady at the next house. The old lady knew exactly where a shop was, and it was only about 200 meters away. I thanked both women and pushed my bike to the shop. There was a woman there fixing a bicycle. But as soon as I got there, she stood up and came to the door of the shop. I explained that I had a hole in my back tire, and she was back in a few seconds with her repair kit. It was amazing to see her work. She took the tube from inside the tire, found the leak, patched it, found the small sliver of glass that had caused the leak, removed it, and returned the tube to its place and pumped the tire up again, all in about eight minutes. Another amazing thing was the price. She charged me ¥1,300. I calculated in my head that she was making, at that rate, about 10,000 yen an hour. But I also thought she must have long periods of time with no customers, and keeping her shop open was also an expense. So I paid happily and started riding home. About a kilometer later, my front brake cable broke. I could ride without a brake, but it would be dangerous. So again I started looking for a bicycle shop. I found one near my house, with a very old couple, the man fixing both motorcycles and bicycles. As soon as I entered the shop he stopped what he was doing and fixed my cable. He was very careful with every detail. Again, he was very fast, taking only about 20 minutes. What was really astounding was that he charged me exactly one thousand three hundred yen. I figured that all charges for fixing a bicycle in Japan were ¥1,300. Unfortunately, I was only carrying 1,100 yen. The man said, “Don’t worry about it, I’ll just charge you what you have. I was embarrassed, but I paid what I could and then left. I came back the next day and gave him the other 200 yen, and a small present as thanks. Living in Japan has some real advantages. Small business owners are so attentive and helpful, and do things quickly and correctly. These two shop owners made me remember one of the reasons I stay in Japan; it is a country that works, and works well. Hey, looks like you've lost weight and looking great! The bike story does say a lot about Japan. Here, fixing anything is a very pricey thing and most people just buy new. Probably why our garbage is shipped out of the country since we have so much. I know it's illegal but heard it's being done. Great article. I would love to hear about the medical care / expenses of Japan. That is of course, such a huge topic of debate and interest ere in the U.S. We are all very hopeful that Obama will do as he said.